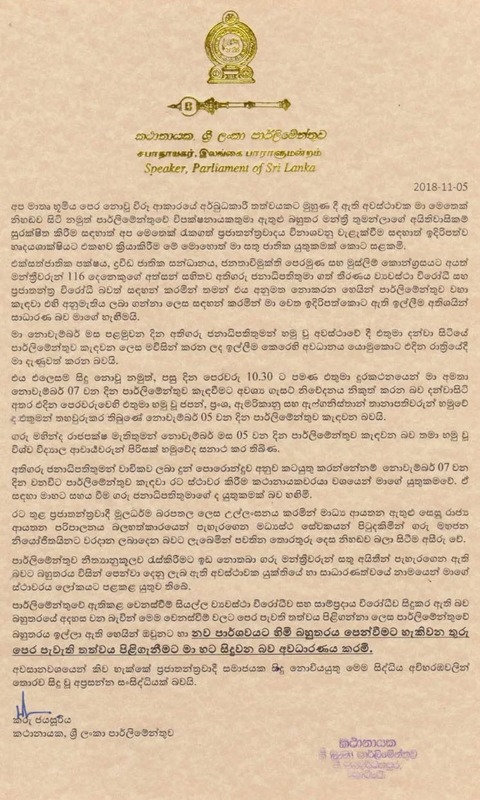 Speaker Karu Jayasuriya in a statement says until a new faction is capable of showing a majority in parliament, he is compelled to accept the state of parliament that existed before the change. In the statement, he says he is compelled to do so as a majority in parliament believe the changes that took place are unconstitutional and against tradition and have requested him to accept the parliamentary situation that existed before the change. The speaker goes on to say, until this moment he remained silent in the face of this crisis situation, however, he stresses it is his national responsibility to act according to his conscience because of the need to protect the rights of a majority of MPs including the opposition leader of parliament as well as to prevent the destruction of democracy which was safeguarded thus far.